Specs: beach, cable wakeboard park, museum, lighthouse, snorkeling, diving, artificial reef. 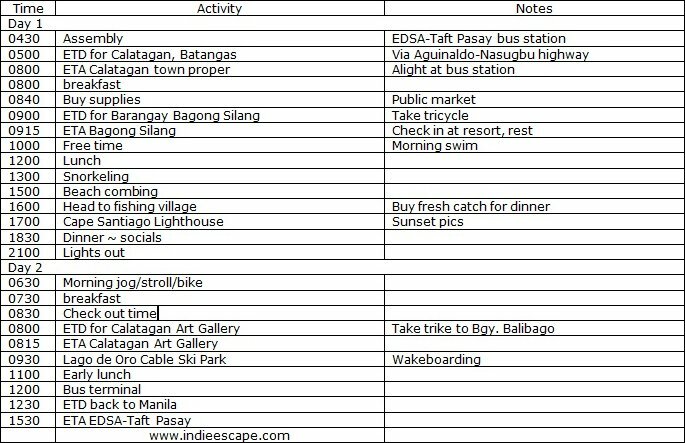 - This itinerary is ideal for a weekend family or barkada trip to Calatagan, Batangas. - Calatagan is a provincial town located in a peninsula in Batangas surrounded by the Verde Island passage (from South China Sea) and the Pagapas Bay. - Barangay Bagong Silang, in my opinion, has the best shores in Calatagan. Check Google maps to see the white coastlines yourself! The water is clear and shallow, but on most areas the seabed is rocky only a few steps from the shore. - Accommodation in Calatagan is not a problem, if you have the budget. There are full service resorts and beach houses for rent (prior reservations necessary). But for the budget conscious, there are also some modest accommodation available. - On this trip, we stayed in the Calatagan Peninsula Resort (CAPOceans foundation). Rooms are at P2500 (good for 3-4), P4000 (beachfront, good for 8-10). I will post a list of Calatagan resorts later for reference. - The bus station in Calatagan is located in the public market. Upon arrival, the first agenda is to look for a good place (read: carinderia) to have breakfast. - The tourism office is also located in the area, I suggest dropping by the place if you haven't made any reservations (ask them for recommendations). - After breakfast, do a quick rundown of your shopping list (food ration, toiletries) and tick off the missing ones before heading to the beach resort/rest house. - Rented beach houses and some resorts allow full use of the kitchen for cooking. - From the town center, take a tricycle to Bgy. Bagong Silang (P80-P120). - Save the rest of the morning for swimming because the tide starts to ebb by late afternoon (around 3PM). - Arrange a snorkeling tour after lunch. Our resort offers them for P100 per person, plus P500 for each guide (goggles and life vest included). - The water should have partly receded by around 4PM, take this opportunity to stroll along the beach and explore the area. - You can buy fresh catch from the fishing village nearby. They sell their haul in the village every morning (before 9AM) and afternoon (4PM). Just tell the tricycle driver to bring you to the village with a basketball court to buy some fish. Bring a cooler to keep the sea bounty fresh. - Next, head on over to Cape Santiago Lighthouse. The keeper arrives just before sundown and will gladly give you a quick tour up the tower. A stunning view of the peninsula awaits 92 feet above. - After shooting the sunset, it's time to go back to the resort for dinner and some socials. - The next day, watch the tide flow in as you do your morning stroll/jog. Biking all the way to the town is also a great idea (read about my morning route here). - After breakfast, it's time to pack up and check out. - Visit the Calatagan Art Gallery before heading to Lago de Oro Cable Ski Park. - The wakeboard park opens at 9:30AM. Walk-in guests can try out the sport for P400-P550 (1 hour). See other rates here. - Have an early lunch before taking the bus home back to Manila. - From EDSA-Taft in Pasay, take a bus bound to Calatagan, Batangas: Crow Bus or Celyrosa Bus (first trip to Calatagan at 4AM, last trip 4:30PM); last trip to Manila at 4:00PM). - If you're coming from Lawton, take Erjohn bus. - There are also buses going to Calatagan from Ali Mall Cubao bus terminal and in Alabang. - You can also take a commuter van. They're parked in the basement of Metropoint mall in EDSA-Taft Pasay. - Travel time from Manila is about 3 hours, via Aguinaldo Highway-Tagaytay-Nasugbu. - Drive to Tagaytay via Aguinaldo highway in Cavite or Santa Rosa, Laguna. - Follow the directions to Nasugbu, Batangas. This highway goes straight all the way to the junction of Palico. - From Palico junction, you will pass by Lian, before entering the town of Calatagan. - To reach the barangay, just drive straight, passing by more famous resorts like Lago de Oro, Stilts and Playa Calatagan. - There are many other resorts along the road before reaching Bgy. Bagong Silang, like Ricky Reyes's Golden Sunset, Lago de Oro and Matabungkay beach resort (in Lian). - Divers can arrange a dive to the artificial reef maintained by CAPOceans fundation. It features underwater pyramids made of cemented coral blocks. - This sleepy town doesn't have a lot of options for night life. I think you can check out the bar at Ronco beach if you're looking for some drinks and music (videoke). - The next day, you can choose to maximize your stay in the resort and go for a morning swim before checking out. - Before going to the art gallery, you can stroll around the town plaza to see the church and get a glimpse of the people's daily life. - If you're not up for wakeboarding, visit Burot beach (Elizalde compound), another prized stretch in Calatagan, before SM develops the place (the corporation just bought the property early this year). - A stopover in Tagaytay is a great way to end your trip before finally heading back to Manila. Late afternoon stroll on low tide. Notice the virtually garbage-free beach! Clear water, peaceful tide, shallow beach. Recently I came across some great articles on your site. The other day, I was discussing ( http://www.indieescape.com/2012/05/calatagan-beach-batangas-itinerary-2.html) with my colleagues and they suggested I submit an article of my own. Your site is just perfect for what I have written! Would it be ok to submit the article? It is free of charge, of course! Hi, where can I ride a bust bound to calatagan in alabang? i know i ride in the pasay area. it's in a side street beside a local traveler's hotel in edsa/taft before but near the LRT. the are is about Php 190. @Dane Salazar - not really sure. Try to look for CelyRosa bus in Star Mall..
Or maybe two segments - to Tagaytay, and then another bus to Calatagan.